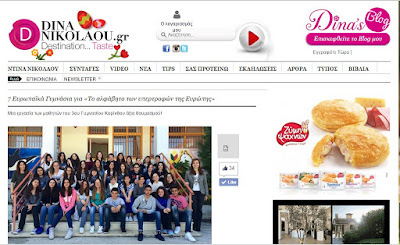 Dina Nikolaou, a distinguished Greek chef presented an extended article on our work on her much-visited site. Dina Nicholaou was born in Greece but nowadays she divides her time between Athens and Paris. She studied economics and marketing, shortly worked in the fashion world, but gastronomy and the art of cooking won her over. She went on, studying professional cooking at the gourmet cooking schools in Paris, Le Cordon Bleu, Ritz Escoffier, Alain Ducasse formation, Lenotre.In Athens she appears on television every day on the show “Hungry Agents” on Star TV, where she shares the daily family care with viewers, but also her knowledge of the raw materials of the Greek land. She collaborates with the magazine “Gastronomist”, belonging to the company group of the newspaper “KATHIMERINI” and teaches at the vocational Cooking School, Chef d’ Oeuvre. In Paris, she defends Greek cuisine in the restaurant «Evi Evane», passionately and with creativity. Greek cuisine travels throughout the world, through Dina Nikolaou’s presentations in Gastronomic Festivals. She has written 5 cookbooks. Among these, «The cookbook of the school Chef d’ Oeuvre», which won first prize at the international competition Gourmand (World Cookbooks Awards) as the best Greek professional cookbook. Her last book was published in France by the French-Swiss publishing house «La Martiniere» with the title “Grece, cuisine familiale et traditionnele – Dina Nikolaou” while in Greece it was published by publications “Fereniki” with the title “At mother’s kitchen”. Simultaneously to the TV show in Greece, she works feverishly on a French cooking show called «ma cuisine grecque, Dina Nikolaou», on French CUISINE TV, where she puts up Greek cuisine and Greek products. When we sent Dina our work , she sent us the following email: Congratulations, children. You made me really happy. Sent me a newsletter, the link and a photo of you ( if you want and your parents agree) to put them on my site which is much- visited so that everybody learns about this nice activity and you set an example to all. Kisses - I am sending you my e-mail address. So, we were overcome with joy when we saw the extended article on Dina's site along with some photos she chose to upload( it is interesting to see which as we sent her many), along with the link to our blog and the link to the ebook the Greek team had without the menu. 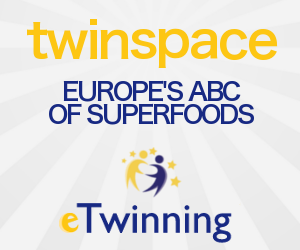 Dina starts the article called '7 EUROPEAN SCHOOLS FOR THE ALPHABET OF SUPERFOODS' by saying that it is a work of the students of the Third Junior High School of Corinth worth admiring!